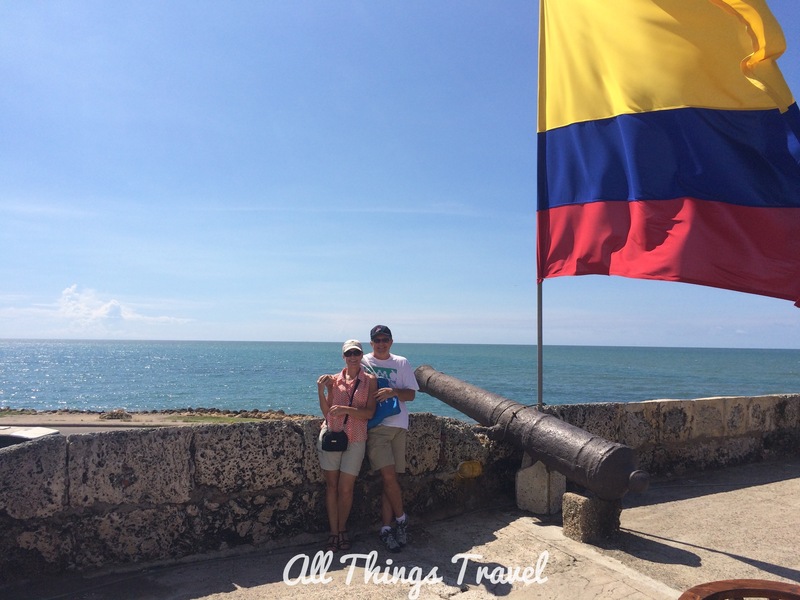 The last port of call on our 14 day Panama Canal cruise was Cartagena, Colombia. The U.S. State Department maintains a travel warning for Colombia, but tourist areas are considered safe. Tourists are warned not to venture into rural areas, however, where drug trafficking and kidnapping still occur on occasion. 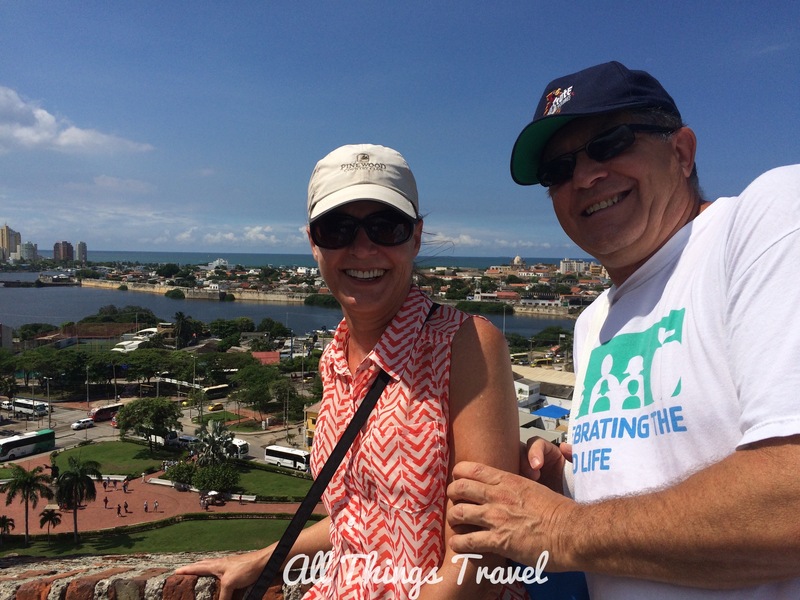 This was our second visit to Cartagena. 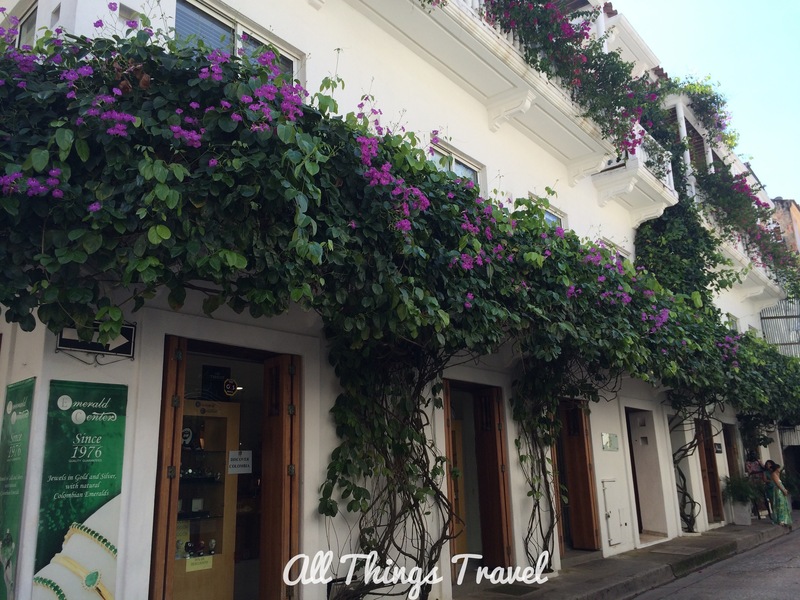 Our previous visit occurred in February, 2013 and we were charmed by the old colonial city with its Spanish architecture and colorful tropical flowers, especially the Bougainvillea. 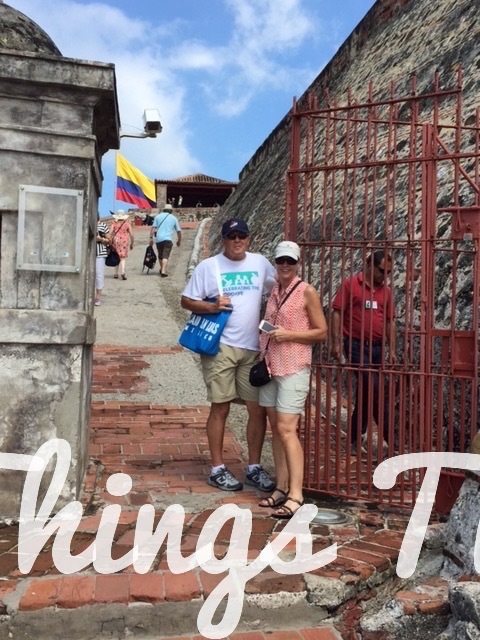 We walked the 12 foot high ramparts surrounding the old town while drinking in breathtaking views of the Caribbean. Then on our cab ride back to the port, we spotted a fortress high on a hill and we knew immediately we’d missed a key sight. 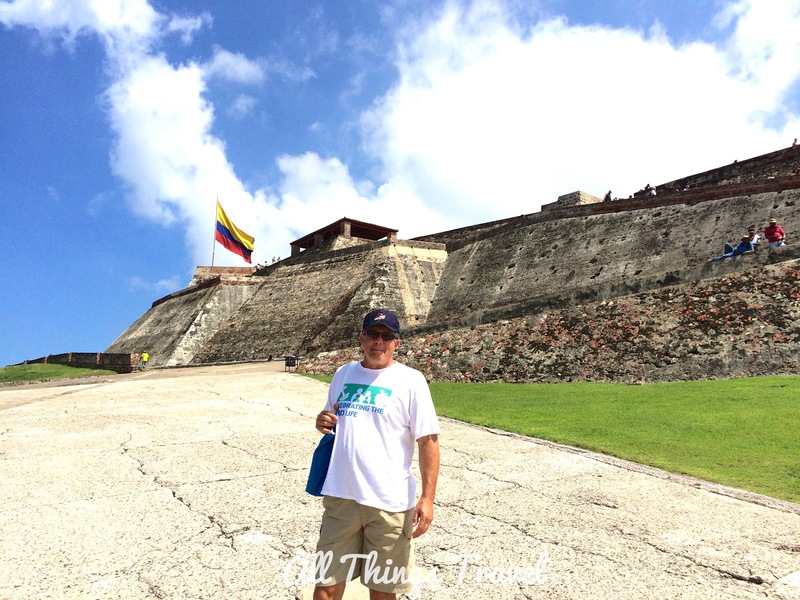 It was Castillo San Felipe de Barajas, and this time we were intent on touring it so we made it our first stop. This UNESCO World Heritage Site is remarkably intact and fascinating. 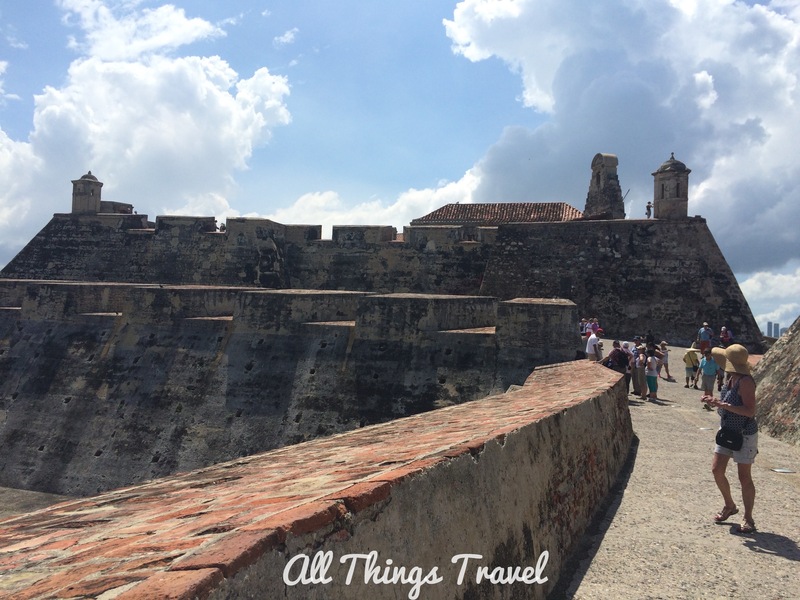 Built in the 1600’s to ward off repeated attacks by pirates, including the likes of Sir Francis Drake searching for booty of gold and silver, it is the largest fortification constructed by the Spanish in the new world. The fascinating part is an extensive system of tunnels built under the fortress for storage, communication, and escape. The acoustic design resulted in amplification of sound so that intruders would be detected if they somehow gained access to the tunnels. 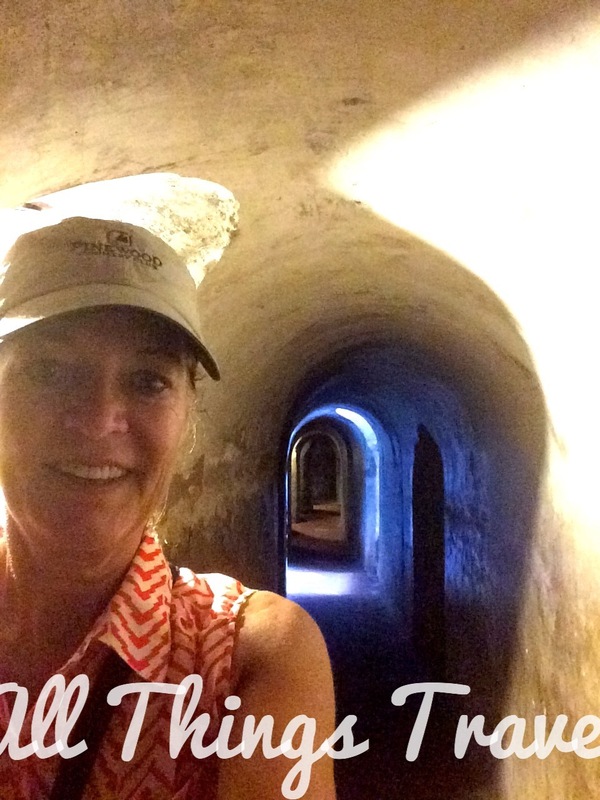 A generous portion of the tunnels is open to the public and although they are low and narrow with a number of steps up and down, I explored every accessible bit. After the hot, steamy climb up to the fortress with little shade, it was a relief to get out of the sun. After spending sufficient time and energy in the steamy heat exploring the fortress, we ventured onward to the old town which is also part of the designated World Heritage Site. 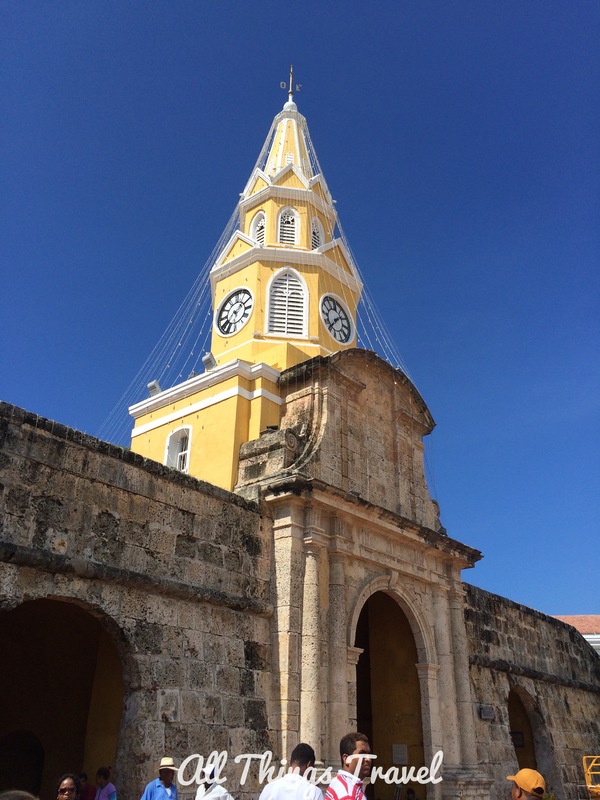 The clock tower is a famous Cartagena landmark and the easiest starting place for a self guided tour and a good place to meet your pre-arranged transportation at the end of your visit. It was once the main and only gate into the walled city. Immediately inside the Clock Tower Gate is Coach Square, so-called because it is where the horse-drawn carriages line up to provide tours. Notice the balconies on the buildings. You’ll see them everywhere, designed to catch the sea breeze in a sultry climate along with the covered walkways to provide shade. 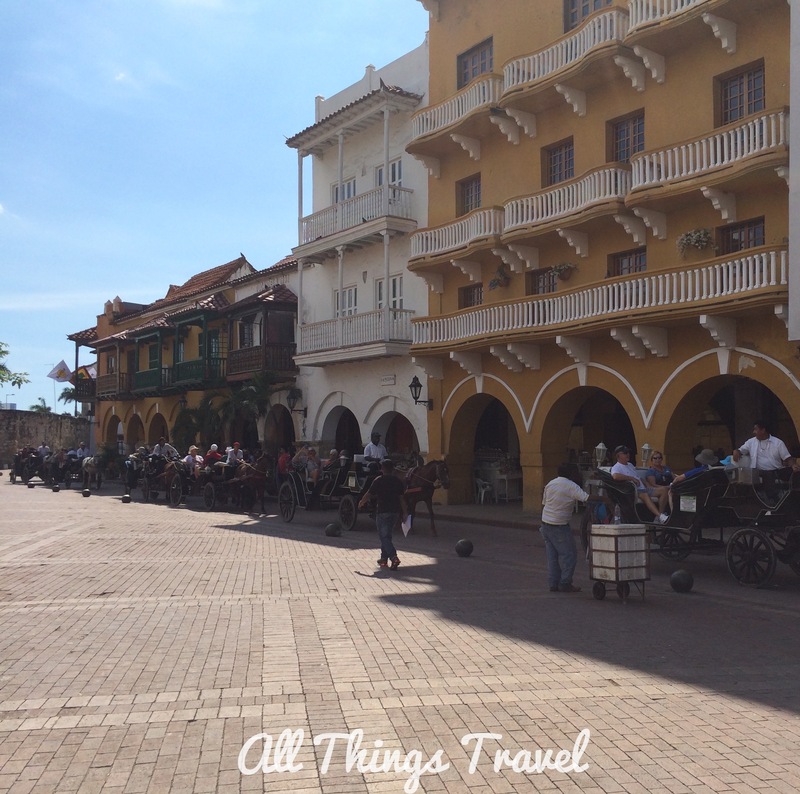 Historically, this square was originally named Plaza del Esclavo, the scene of slave trading in the 17th century. 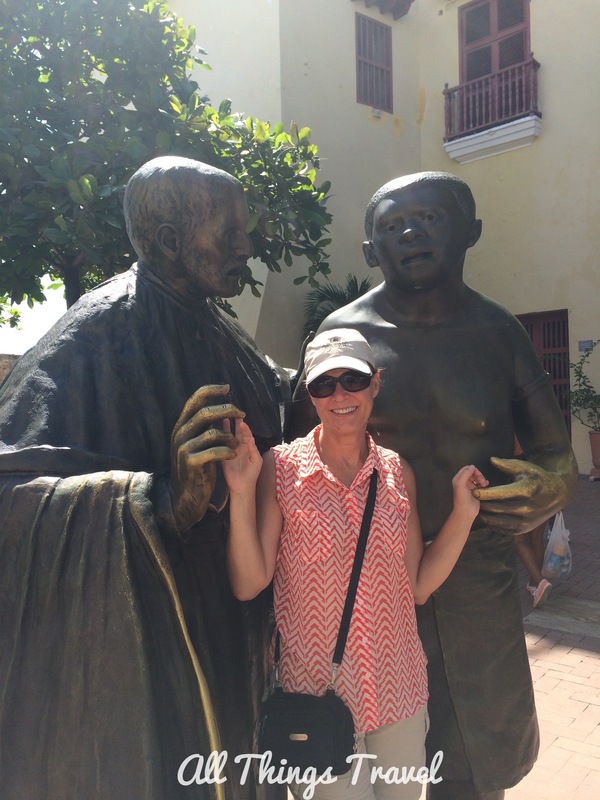 San Pedro Claver, the first person canonized in the New World, was a Jesuit priest who befriended and served the African slaves who were traded in Cartagena. In addition to the square and church named for him, there is a sculpture of him located here. 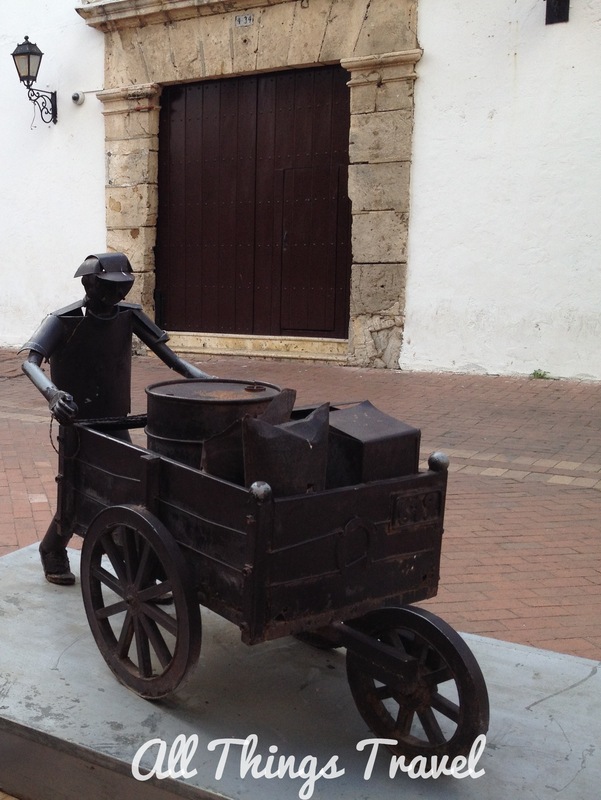 Other sculptures around this square are scrap metal depictions of modern everyday life in Cartagena. 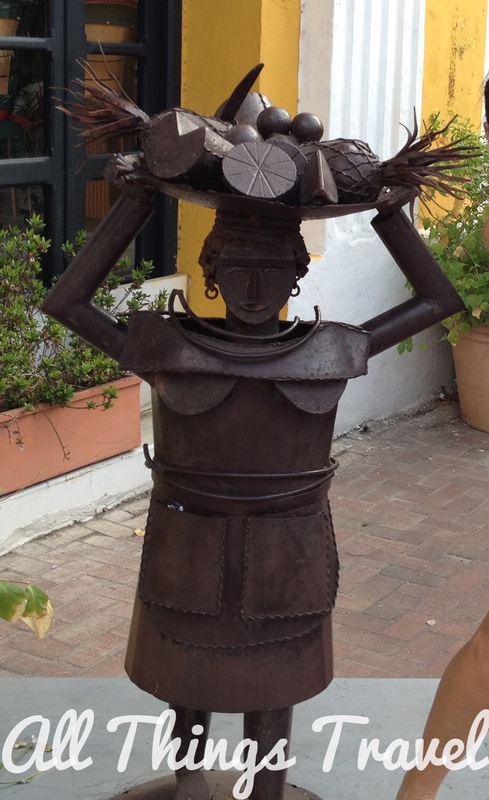 Created by Eduardo Carmona, this street folk art adds another charming dimension to the old city. 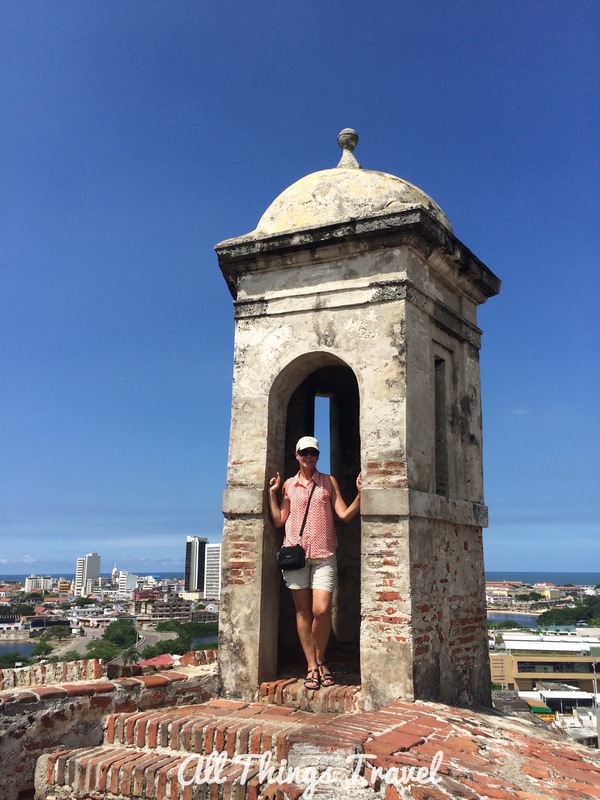 Nearby, we found a staircase to the ramparts so we ascended to take in the views from above. It is admittedly more uncomfortably hot walking the ramparts with no shade for relief so this time we soon escaped back to the streets with shade. 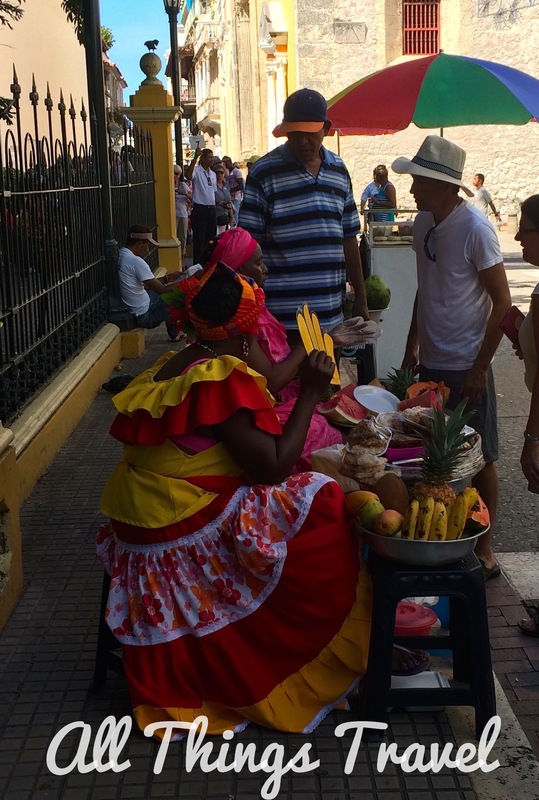 Nearby, the Plaza Bolivar, named for Simon Bolivar who liberated Colombia from Spanish rule in 1811 and became the first president, offers a welcome shady respite. Wow—that was such a wonderful and colorful post. I loved the sculptures and your quote at the end is very appropriate for this place. Beautiful. Thanks for sharing it with us. Another place to put on the list of places to visit. I love the rich colors, too, Beth Ann. 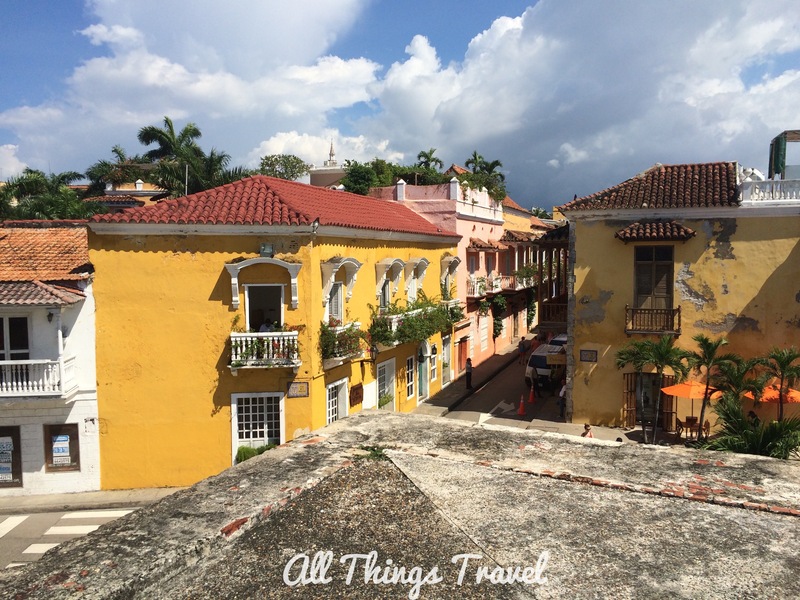 There are so many warm, colorful places to visit in the Caribbean. I still have many on my list! 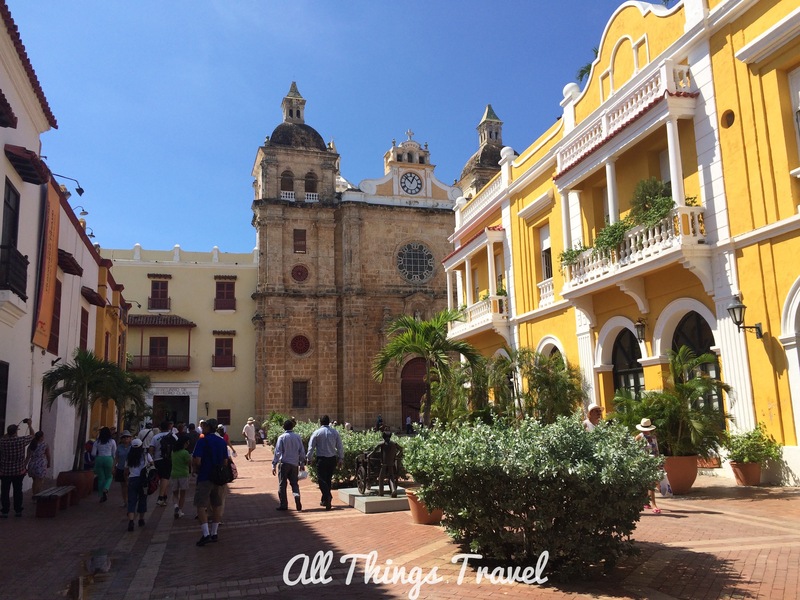 Yes, the history is fascinating and a day is hardly enough to explore all that Cartagena has to offer. Thanks for stopping by. Beautiful above ground and those tunnels sound amazing! Well done,Laura! Happy New Year!